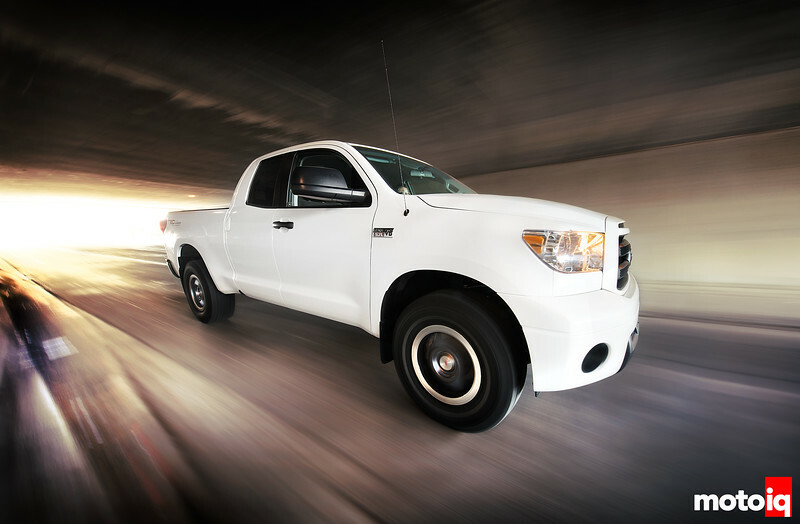 Project Tundra is MotoIQ's work horse. It's used nearly every day as a commuter, usually hauling a load of parts at the same time. On the weekends it hauls bikes and go karts. It frequently hauls cars to races and fab shops. Several times a week it takes our crew and equipment to photoshoots. To read more about Project Tundra, Click Here! We spend a lot of time in Project Tundra and if we can do a few things to it to make our life a little easier it is all a good thing. All of our race tracks in Southern California are in hot areas and most of them are in the desert. This means that we are constantly fighting heat, blowing sand, debris and other severe environmental conditions. To help keep Project Tundra's interior cooler and to protect our paint, lights and trim from abrasion and pitting during road trips, we called upon the folks at 3M for help with some of their advanced film technology. 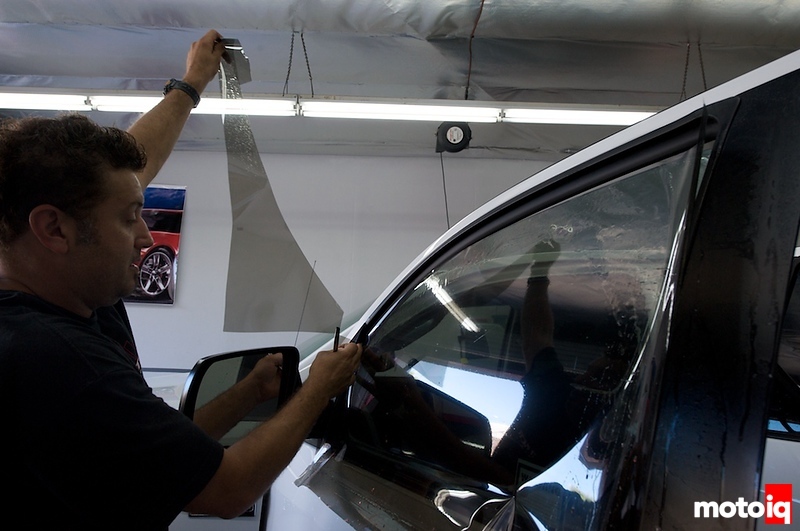 The Tint Factory's Frank Garrido first squeegees the 3M Crystalline film onto the outside of the side windows. We were just about to leave for the Las Vegas round of the Formula D circuit and we knew it was going to be hot. We were not looking forward to the long trek across the desert in scorching 112 degree heat. We were also not looking forward to facing a hothouse like car interior when we kept the car parked at the venue. We had some concerns about heat damage for our delicate camera and datalogging equipment as well. 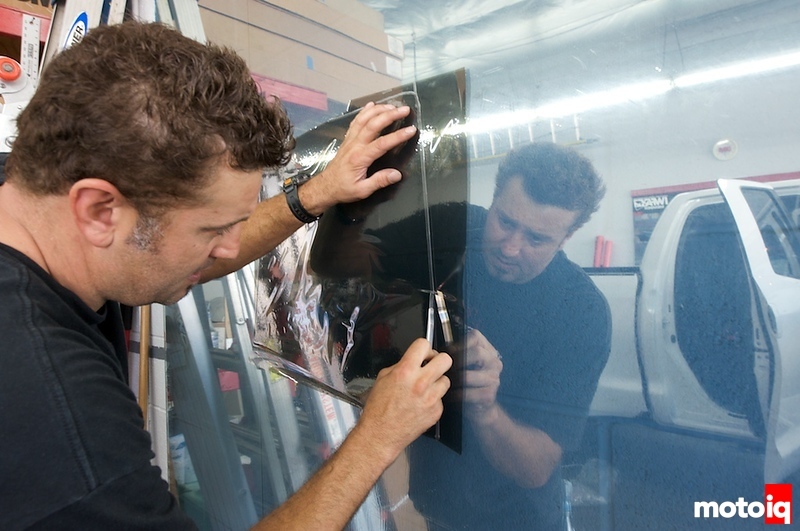 Then Frank trims the 3M Crystalline film to rough shape on the outside of the side windows. We contacted our friends at 3M to see if they had any solution for this potentially serous problem and they suggested we try their Crystalline heat rejecting window film. More than just another window tint, Crystalline is a high tech window film that rejects heat at an amazing rate while allowing visible light to pass through nearly uninhibited. The film is transfered onto a piece of glass on the wall for further trimming, especially of the bottom edges.